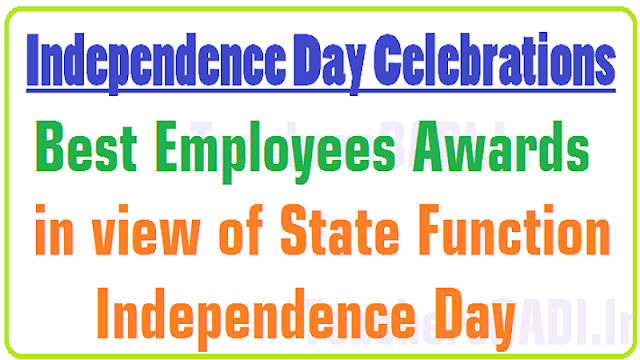 Proposals for Best Employee Awards-in view of Independence Day Celebrations 2017/Best Employees Awards 2017 Notification in view of State Function Independence Day 2017: Warangal Urban District Collector has given the Best Employees Awards 2017 Notification in view of State Function Independence Day 2017 and Proposal are invited from all Heads of the Departments in Warangal in the prescribed proforma for giving awards or certificates to the selected Employees who rendered meritorious service. Collector's office Proceedings details are given here. STATE FUNCTIONS: Independence day Celebrations-2017 on 15.08.2017 in Warangal District. Best Employees Awards. Called for Proposals in time. Updating the list of names and address of the Regional and District Officers. Reference: Upcoming Independence Day-2017 on 15-08-2017. The District Collector has invited attention to the subject and reference cited. In view of the Independence Day Celebrations-2017 to be held on 15-08-2017, the certificates or awards will be given to the employees / NGO who rendered meritorious service. Therefore, all the Heads of the Departments in Warangal District are requested to send the following proposals/ information. All the Heads of the Departments may be requested to send the proposals recommending the individual / organization for their exceptional service to the public in Proforma - II. All the Heads of the Departments may be requested send their names and address of all the District Officers in Proforma - III. The proposals for the awards should reach the District Revenue Officer, Warangal Urban through special messenger in both soft(Excel Format) and hard copy in the prescribed proforma-I enclosed before 07-08-2017 by 05.00 PM. Any late entry shall be summarily rejected and it will be finalized by 11-08-2017. You are also requested to send the brief notes in Bullet forms on achievements of your department worth to be mentioned on the Independence Day 2017 to the DD, I&PR, Warangal, by 05-08-2017 under intimation to the CPO, Warangal for submission to the District Collector, Warangal for approval.